The five Portsmouth seniors who helped Coach Noah Fannin revive the soccer program. Senior goalie Gage Mosley boots the ball from his own goalie’s box on a goal kick in the Trojans 5-1 sectional loss to West Union. Sydney Edwards scored the Trojans lone goal in Portsmouth’s sectional match with West Union Saturday morning. 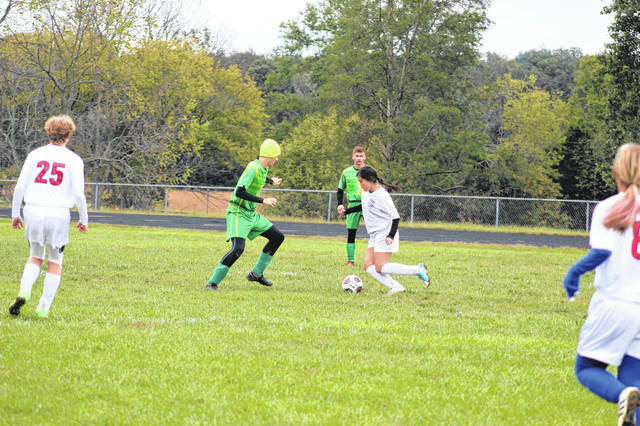 The first season of Portsmouth Trojans soccer since 2004 ended Saturday morning with their sectional loss at West Union at the hands of the Dragons, 5-1. The Trojans lone goal of the contest came with 16:00 left in the first half when senior Sydney Edwards found the back of the net on a rebound shot to cut their deficit to 3-1 after West Union was able to create some scoring opportunities in the earlier portion of the half. The score would remain tied at 3-1 heading into the halftime break, but the Dragons were able to extend their lead to 5-1 in the later stages of the match, sealing the Trojans fate. Yes, the Trojans were only able to win one match in their season slate. All new upstart programs face issues in their first year, especially a program where most of the kids who are playing have never played a second of organized soccer prior to this season. The exception to this rule, of course, is the Las Vegas Knights of the NHL who made the Stanley Cup Finals this past season in their first season of existence. But still, they were a team that was full of professional hockey players whose actual profession was to play hockey, something they had been doing their entire lives. It is much more difficult to do what the members of this young soccer program are doing led by first time head coach Noah Fannin. It takes time, effort, and resources to develop a winning culture and a winning program like Fannin is attempting to do. Players have to have practiced for years to develop the necessary stamina and skills to be able to compete with area teams who will make deep runs in this year’s post season. Throughout the match, the players for Portsmouth were constantly encouraging one another to do their best and give their best effort. And to be honest, it worked. 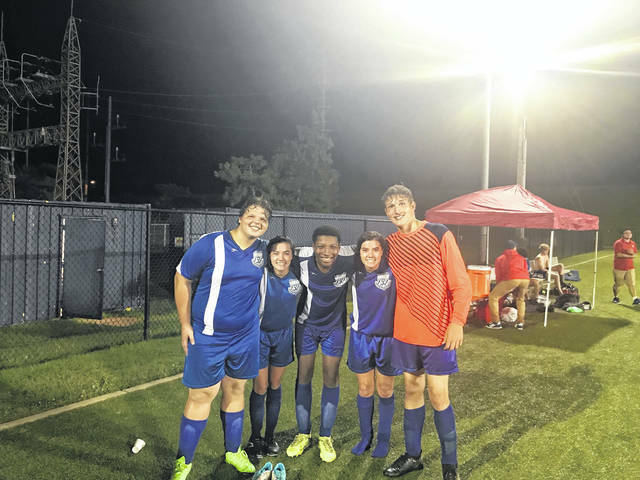 A team that was led by five seniors who were playing in their final match of their first season of organized soccer was competitive and intense for the entire length of the match. 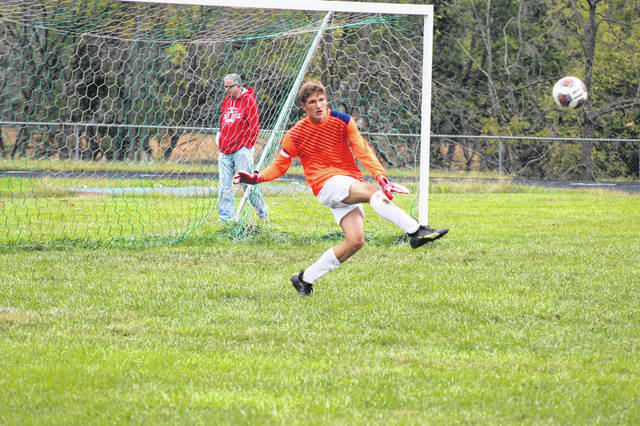 The players took to the idea and selected the position they wanted to play, and Fannin even found that moving senior Gage Mosley to the goalie position opened up some new opportunities for his team as they headed down the home stretch prior to Saturday’s game. After their senior night, the five Trojans seniors were very uplifting about their experiences playing soccer this season. “I wasn’t friends with anyone on this team, but now we’re all really good friends” said senior Gage Mosley. When asked if they were glad they played soccer for the upstart program, all five emphatically agreed. After West Union’s win Saturday morning, they will go on to face Northwest at Roy Rogers field at 7:00 p.m. following the conclusion of the Lady Mohawks match with Piketon.